I even like raking leaves...for a day or two. We have more Oak trees in our yard than anyone else on the planet. And, horticulturists will tell you, they hang on to many of their leaves until after the first snow. That means that after I've grown sick and tired of raking and moving leaves to the woods in the Fall, for about six weeks straight, I am treated to the same program the following Spring. After the last of the winter snows melts away, my yard is once again covered with leaves that were dragged down by snowfalls over the winter months. I start the Spring by cleaning up the Fall, year after year. However, I have found one good artistic use for them. Many years ago, I came up with some painting programs for first graders. The school my boys attended had done away with art classes and I rounded up some friends to go into the classes to teach differing art forms. I decided to teach watercolor painting to 7 year old school-children, with much success. 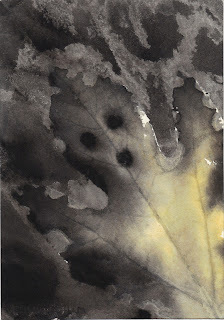 Not only did they come up with some nice paintings, I discovered a way to capture Fall leaves on paper. Now, I can't tell you all of my secrets, but I use paint, brushes, paper, and leaves. Sometimes, I add waxed paper or paper towels to my tool kit and even a printing roller. They used paint and brushes, too, and then they used their hands and their sleeves, they spilled paint on their pants and socks, and managed to smear it all over their faces and it even showed up on homework they turned in a week later. More than once, they got some great effects on their foreheads...easy to do from their perspective, hard to frame. At least it was watercolor, so the teacher, their parents and the janitor didn't hate me forever! As for my ongoing attempts at home, the effects differ based on time of year (leaves used after the first frost are much better), the humidity of the day, and the texture of each leaf, and my mood. Sometimes a trip to the winery makes the watercolor flow better! That's another story. As with all watercolors, sometimes they work and sometimes they don't. You can't go back and fix mistakes easily and I end up ripping up a lot of paper. I am reminded of producing these annually. 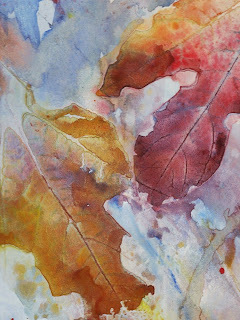 My wife, who loves the leaf paintings, routinely collects interesting leaves and throws them at me by the score, but the other ingredient that's hard to express, to her and to others, is that I have to feel like painting. Some years, Fall has come and gone and I haven't touched a single leaf for the purpose of capturing it before its demise. Last year, my wife spotted a leaf that reminded her of a ghost. "Try this one," only put a face on it. I stared at the leaf for weeks. Not the same one, of course, as each few days when she discovered the wilting leave she'd bring in another. Finally, I caved to the pressure and did the deed. Colors weren't working for it. Unlike a real "Fall" leaf, these "Ghost" leaves had to be dark and sinister. Then, I felt that the eyes weren't strong....painted in after the watercolor was done, they faded into the picture. My son, watching me with one of the set, said "Why don't you put holes in the leaves first?" So, I did...worked much better. The eyes "belong" to the ghost. Wow, a family project! So, this year, all of the trees delivered another two seasons worth of leaves. And, my wife saw a new batch of ghosts. Oh, and don't tell her. When she's not home, I paint on the dining room table. And, much like those first-graders, I tend to throw those brushes and that paint around a bit. Fortunately, my wife's eyesight isn't what it used to be so she rarely spots the colors of Fall on the furniture and walls. If she does lean in to something for a closer look, "What's that spot on the wall?" I point quickly out the window and say, "Look at that leaf! What do you think I could make that look like in a painting?" Another close brush with Fall! 2 of your leaf paintings hang in my studio - I love them so much!!! They always make me smile and remind me of you...miss you! !